defensive forces in the 2011 season. Olathe East's Matthew Baltimore made a verbal commitment to play at Northern Illinois this past week. 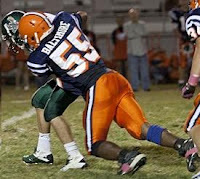 The talented 6-foot-4, 230 pound defensive end will play the same position for the Huskies when he arrives on campus in 2012. Baltimore was one of the top juniors in the Sunflower League last season, raking in 17.5 tackles for loss, nine sacks, two forced fumbles, and nine pass deflections. Baltimore joins SM East's Elliot Faerber as the second player from the class of 2012 to commit to play football at a division one program. Faerber has committed to play wide receiver at Illinois. Did he get anyother offers? According to Rivals.com, he had offers from North Dakota, North Dakota State and South Dakota State, which are all FCS (D-1AA) schools. NIU was his first FBS offer. That's good for him, that kid has serious talent. Like where? NIU won 11 games last season and is one of the top non-BCS schools. yea 11 games in one of the worst conferences and LOST the championship game. Elliot Faerber already committed to Illinois, nowhere close to the level of play at NIU. Faeber will be the best WR in the state, so get ready for the real player in the "spotlight". I feel like players from Kansas dont get any respect. Rivals for example, doesnt have a single KS player in their Top 100 recruits. I'm an ON fan, but Faeber should have been in the Top 100. Thanks for getting this site cleaned up. 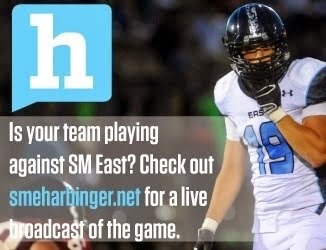 This can be a very useful tool to communicate about high school football. I believe that ONW has the best shot at the 5A championship this year. Just out of curiosity, did Faerber have any games with over 200 yards receiving last year? Im close to the Faerber family, do to some private matter Elliot will be attending Shawnee Mission South this year. First off, its way to late to be joking about that becuase if he transferred this late he wouldnt be able to play football. 3rd off funny how SMS wishes they could have Elliot but SME would not consider having a single SMS raider. and last but not least, if you are truly a girl then get off this site because nobody will take you seriously. he didnt just transfer, this has been kept quiet for a little for certain reasons. But with the knew district boundaries taking being set in place last winter/spring, and for personal reasons he had to move in with a family member who now lives in the south district. sorry im just trying to be informative. Hey man, this is a public blog, meaning anybody can post on here, sjust because a fan is a woman doesnt make her any less welcome. As far as I'm concerned anyways. she can comment but i found it funny she made such a terrible claim. Why would a D1 shawnee mission east athlete transfer to a school that hasnt had a winning season in at least a decade and 3 coaches have left not fired but left.